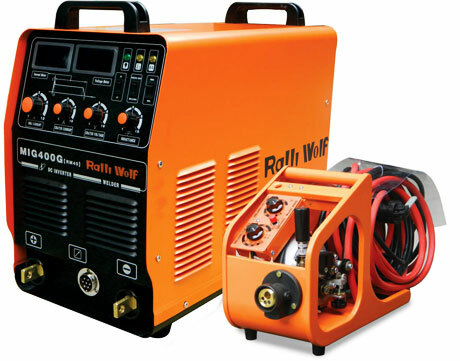 Ralliwolf offers Semi-Automatic IGBT Inverter based dual purpose MIG welder for both MIG and MMA Welding application. The machines are available in the range of 200/250/400/500 Amps. Light weight, Power saving, High efficiency, Inverter based power source for high quality MIG / MAG semi automatic manual and semiautomatic mechanized welding applications. Light weight, Compact design of power source, wire feeder and Torch. Suitable for solid and flux cored wires. Inbuilt wire feeder facility in 200 and 250 amps range makes the machine highly portable. True Constant Voltage characteristics with IGBT inverter technology. In built “VOLT-AUTO” mode reduces the time for parameter presetting. The arc voltage adjusts itself automatically to produce correct arc voltage corresponding to the Welding current set by the operator. Crater voltage and Crater current adjustment through digital front panel. Electrolytic copper winding of the main transformer & chock coil ensures longer life and trouble-free performance. Highly Energy saving with about 85-90% efficiency and power factor >0.9 with negligible NO LOAD loss. Low inertia, high torque, Servo type, Printed Circuit Wire Feed Motor for precise wire feeding and quick response characteristics. Ergonomically balanced light weight Euro type Torch reduces operator’s fatigue.